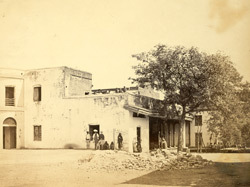 Photograph of the exterior of the Government Female Normal School at Nagpur in Maharashtra from the Archaeological Survey of India Collections: India Office Series (Volume 46), taken by an unknown photographer in c. 1870. Normal schools were teacher training schools and The imperial Gazetteer of India states, "In the case of primary teachers and the lower masters of secondary schools the courses of study and the examinations are organized by the Local Governments, and central and District schools are maintained for their instruction by the Government, and in some cases by local boards and missionary societies...Stipends are frequently given to the pupils, who then bind themselves to teach for a specified period. The courses include general and technical subjects and practical training." The number of female Normal schools increased dramatically after 1871 and many of them were run by missionaries. This increase was in response to the need for more female teachers as the Gazetteer also states that, "In 1871 there were 134 secondary and 1,760 primary girls' schools; in 1901-2 the numbers were 461 and 5,628 respectively."